The eLearning experience is proven to increase knowledge retention by 25-60%. eLearning requires 40-60% less employee time than learning the same material in a classroom setting. Revenue generated per employee is 26% higher for companies that offer training using technology. 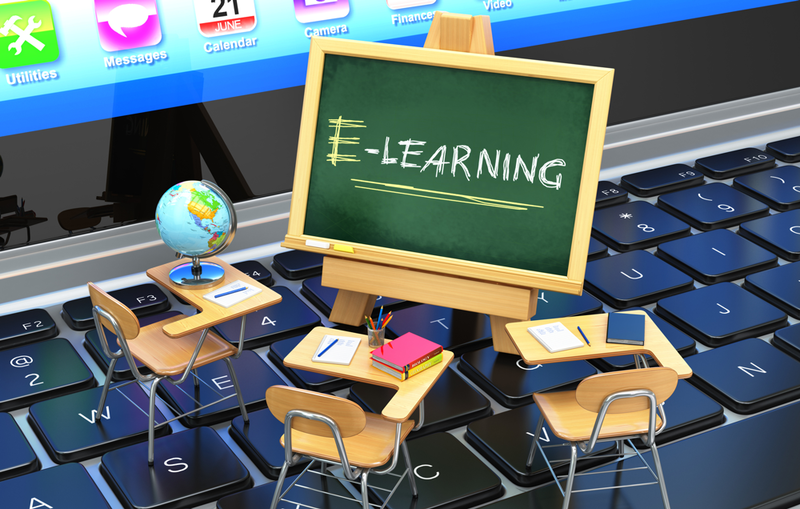 67% of associations now offer eLearning in some form. Corporations save between 50% and 70% on costs when they replace instructor-based training with eLearning. And the list goes on! However, that’s not to say traditional teaching techniques are dead. But with stats like these supporting the revamping of educational content delivery, it’s hard to resist going digital if your organization’s goals are to be successful, efficient and truly helpful to your end users. Now with the tech available today, creating an eLearning course isn’t an overwhelming challenge. Yet, creating an effective eLearning course—one that stimulates the brain, actively engages the participant, and increases retention—requires a great deal of research and strategy. You can’t just simply rely on recording a PowerPoint presentation, throwing it up online, and allowing your eLearners to download the video. That doesn’t cut it. If your objective is to cook up an impactful eLearning course from which participants glean and retain as much information as possible, it’s important that you combine tried-and-true best practices with both innovative techniques and topnotch technology. To put you on the path to success, read up on these 10 practical tips you can use to build interactive and empowering learning experiences that drive results in the digital age. 1. Use scenario-based learning and storytelling. In any educational setting, it’s key to clearly define a problem or concept, identify who the audience is and why it matters to them, and discuss how to resolve or explain said problem or concept. If your student-side participants aren’t able to see the significance of the subject matter, it’s likely they’ll tune out before you can get to the meat of the course. But you don’t need flashy bells and whistles to grab your eLearner's attention. Using scenario-based learning and storytelling techniques are both very effective means of boosting engagement, comprehension and retention while simultaneously providing the student a relevant context in which to digest the information. Scenario-based learning immerses people in a realistic setting, simulation or storyline that requires them to tackle a problem or case using information they collect and skills they develop during the session. Scenario-based learning also offers an opportunity for students to apply what they’ve learned from previous sessions and assignments, helping them to commit their findings to long-term memory. This active practical application of knowledge also allows eLearners to quickly see the benefits of the course, rendering it more effective in comparison to standalone theoretical study. Also note that it’s important to incorporate as many interactive elements into your eLearning course as possible, especially when online classes lack much of the face-to-face interaction traditional classrooms provide. To breathe a little more life into your scenarios, try creating “characters” to which your students can relate, including dialogue that would commonly take place in such a situation, and activating the participant’s emotions through storytelling. And speaking of storytelling… despite its somewhat whimsical connotation (you might immediately associate the term with fairytales, camp fires or coffee shops), storytelling is scientifically proven to increase retention. Our brains are wired to connect more emotionally with messages that “feel like a story” – it works in marketing and advertising, and it works in education. The fact of the (grey) matter is: when your brain experiences an emotional event, the chemical dopamine is released into the system, helping you to recall details and remember information with greater accuracy. Moreover, a person’s brain relies on two specific areas to process facts and figures, whereas a well-told story activates several other areas, including the frontal, sensory and motor cortexes. So don’t underestimate the power of infusing your content with a narrative or several anecdotal examples. 2. Get visual with your content. When we’re born, we're immediately able to understand images on some level. Relatively speaking, our abilities to process speech—let alone text—develop over a much longer period of time. That’s probably because 90% of the information we send to our brains is visual, and 93% of all human communication is visual. 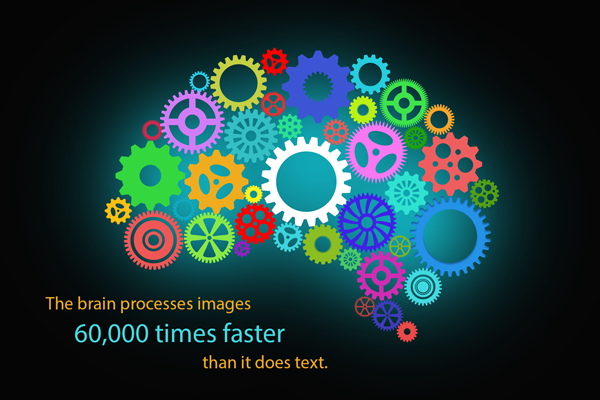 And did you know that the human brain processes images 60,000 times faster than it does text? But it’s not just comprehension that’s reinforced by visual content. A study described on ChangingMinds.org found that after three days, the average participant retained only 10% of written material and 10-20% of information from an orated lecture, as opposed to approximately 65% of the information presented in a visually-oriented illustrated lecture. The moral of the story is: don’t simply use text to get your point across. Any time your eLearning course can incorporate diagrams, graphs, charts, maps and images (or dare we say memes? ), it’s a wise idea to do so. 3. Adhere to the Rule of Three. Ever hear of the term working memory? In a nutshell, working memory (not to be confused with short-term memory) is the cognitive process responsible for temporarily holding information available for mental handling—like a phone number or shopping list—as well as manipulating incoming sensory information and aligning it with knowledge we already have. It’s a fascinating concept, but our working memory does have its limitations. For example, you might read a passage from a book that includes ten or so pieces of information, and over the course of about 30 seconds, you’ll likely already have forgotten three or four of them. Then you’ll have to go back and read it again. And possibly again and again, until you can reliably connect each piece of information with something that’s already effectively been stored for a longer period of time. Repetition and grouping things in chunks are your best eLearning weapons to combat a strained working memory. Therefore, it’s recommended to abide by the Rule of Three – a technique that writers, comedians, politicians, etc. have relied on for years (even centuries) to successfully engage and satisfy their respective audiences. You may not notice at a glance, but if you pay close attention to headlines, descriptive ads and other text-based media, you’ll find that the Rule of Three is deployed practically everywhere, as well as in some of our most memorable expressions. Life, liberty, and the pursuit of happiness… blood, sweat, and tears… lions, tigers, and bears… you get the idea. To integrate this principle into your digital didactic duties, break up learning sessions into bite-sized segments, during which you only ask your audience to remember up to three key points. Never pass up the chance to remind the audience of these key points, and be sure to articulate them in clear and concise language. We naturally appreciate when things come in threes (even if some say that’s a bad omen! ), and so will your eLearning participants come quiz time. 4. Make eLearning physically interactive. This type of content, which can be used in numerous contexts, requires the participant to perform basic physical actions – whether it’s selecting preferences, clicking to answer questions, scrolling over an image to reveal more content, etc. The whole point is to keep them involved in a tangible and tactile manner, as opposed to just watching, listening or reading. One way to jazz up your supplementary educational PDF resources is to create interactive white papers and guides! This interactive content about interactive content (ooh… how *meta*) is a good example, albeit a marketing tool. But you can also invest in less expensive forms of interactive content. Leveraging polls during webinars or creating on-screen prompts that ask students to answer questions or choose a path as they progress through a course are great ways to make a class more action-oriented. 5. Mobile-friendly is a MUST. If your continuing education, professional development or employee training program isn’t mobile-friendly, you’re unfortunately already failing to meet a rather low bar. Today’s students and professionals absolutely expect content to be, quite literally, at their fingertips – and that they could complete an educational track via a smart phone or tablet should they desire to do so. For many on-the-go eLearners, mobile learning is the preferred practice. In fact, LearnDash reports that 70% of learners feel more motivated when training on a mobile device (as opposed to a computer). This may come as a surprise. How can all that essential content comfortably fit onto such a small screen? Enter responsive design – listed at #2 in Top Web Design Trends by net Magazine … in 2012. Yes, that was six years ago. So if your website isn’t responsive by now, you’re officially in the laggard category. But it’s never too late for an update! To quickly catch you up to speed, a responsive website adapts to a visitor’s browser size and resolution using media queries and CSS rules, automatically shifting and rescaling page layouts to conform to the user’s device. You may need to talk to a developer about this, but if you’re using a respectable LMS or online training platform, your content should already be displaying right as rain on someone’s iPhone or Android. Furthermore, a mobile-friendly eLearning platform does NOT rely on Adobe Flash (here’s why). If you’d like to join the 47% of organizations who already use mobile devices in their training programs, or be like these admirable Apps, serve up your content in palatable slices, design clickable images and buttons to appear large, and when possible, offer courses that can be paused and continued later at the user’s convenience. 6. Test early, and test often. Over time, there has been plenty of debate regarding how often students should be tested on the material they’ve been learning about. Henry L. Roediger III, a cognitive psychologist at Washington University who studies how the brain stores and retrieves memories, argues that educators should use formative assessments early on (and frequently) to augment learning during the course rather than delivering one big formal exam at the end of it. In fact, he found that being quizzed on material multiple times can have a greater positive effect on future retention than spending an equal amount of time restudying over and over. Roediger surmised this by comparing the final test results of students who used common study methods (writing and reviewing notes, attending group study sessions, highlighting material, etc.) with results from those who were repeatedly tested on the same material. The reasoning behind why this works so well is that students are essentially forced to retrieve the information they learned from their own memories, as opposed to reabsorbing it from a source in front of them (a notepad, for instance). Even if they don’t do so well on the first test, the outcome is likely going to change in the long run. Interestingly, this approach also helps students avoid procrastinating and “cramming” before the final exam. 7. Cater to different learning styles. Visual learners: We already know there’s value in the old saying “a picture is worth a thousand words” – and we’ve mentioned a couple eye-pleasing, brain-teasing tactics to put this concept into motion (see tip #2). But to give you a few more ideas, try developing a visual equivalent or accompaniment for some of the content you’re already using. For example, you could create an infographic, a workflow chart, or custom illustration for an article or printable handout, or perhaps your syllabus! You can also leverage cartoons and comic strips, which effectively grab the attention of children and adults alike – and can even boost the motivation to study and increase testing results. Audio learners: Here’s where webinar content and narrated videos take center stage. Just be sure you’ve appropriately vetted your presenters (or voice-over artists). No monotonous speakers wanted! However, even if you’re currently short on video content, putting effort into using patterns and rhythmic language in your written content can go a long way with audio learners too, particularly if they’re accustomed to reading material out loud to themselves. Again, think about the aforementioned Rule of Three! Verbal learners: Sometimes, students crave the opportunity to just talk things out in order to better grasp a new idea. If your eLearning course is live, certainly include a Q&A session at the end of the presentation. If it incorporates components that are not live (i.e. on-demand webinars, eBooks, etc. ), offer a virtual office hours over Skype or Google Hangouts or moderate a social media group dedicated to the course. This will help to fill that verbal void some of your eLearners may be experiencing. 8. Administer a post-course evaluation survey. This may seem like common sense, but it really is a tip worth mentioning! Asking your participants to complete a quick 1-2 minute survey at the end of your eLearning course is an easy way to get quality feedback. What stood out? What was particularly engaging or interesting? And what could be improved? Especially in the world of adult learning, your attendees are often equipped to provide you with the most valuable advice. Hearing it straight from the horse’s mouth, you’ll quickly have an idea of what to build into your course for next time. One great way of doing this is to automate the survey, and incorporate it into the workflow of the course itself. Be on the lookout for an eLearning platform that allows for the responses to seamlessly integrate with your CRM (customer relationship management) system and other databases. That way, this data can be stored in one convenient place, and accessed by all relevant parties in your organization. 9. Facilitate a great user experience. In 2018, providing a seamless and streamlined digital user experience is a necessity. No if’s, and’s, or but’s about it! Of course, the tools and technologies you’re using to facilitate the presentation of content should obviously not be clunky or confusing, but they also shouldn’t be the star of the show. The best UX happens when the impressive tech and design fades into the background to support the material students are really supposed to be absorbing. Think of your LMS as the subtly stylish yet sturdy frame for your work of art! Embrace microlearning. Not everyone can sit down for several hours in a row and complete an entire online seminar, sometimes simply because a jam-packed daily schedule doesn’t allow for it. Therefore, it’s critical that you prepare lessons that can be attended in short bursts, and that the consumption of content can paused for a time and then resumed later. Provide a personalized dashboard. Your end user should have access to all the information they need to complete a set of eLearning workflows. This can be contained in an easily navigable dashboard or home screen that also shows their records of completed modules or courses, their quiz and test scores, any certificates they’ve earned, etc. Be mobile-friendly (yes, we won’t stop saying this). We must emphasize that all of your content should be easily accessible and workable online. Greater percentages of people want to learn via smart phone and tablet, and it’s important to keep up with this trend – a trend that isn’t going anywhere anytime soon. 10. Leverage the right technology. A refreshing user experience—from the perspective of both the presenter and the eLearner—stems from utilizing a reliable and intuitive content delivery and management platform. Therefore, the first step toward success is to find a contemporary Learning Management System that suits your organization’s needs, as well as the needs of your end users. Namedropping aside, it’s important that, as continuing education or training providers, you’re empowered by the right tools – and that you’re easily able to organize, launch and automate your eLearning events, as well as everything that comes along with them. And if you’re monetizing your events, or if tracking data and verifying participation is a high priority, you should also favor a platform for which analytics wasn’t just an afterthought. And finally, if you’re launching live webinars or webcasts to which hundreds or thousands of virtual attendees are tuning in, you MUST have a platform that scales to accommodate audiences of any size logging in from any type of device. The virtual event crash struggle is all too real, so keep that in mind when you’re shopping around and evaluating your options! Now that you have the lay of the land when it comes to building a memorable and inspiring eLearning course, start applying some of these tips today! You might be surprised at the results you experience, the positive comments you receive, and the number of eLearners for whom you’ve made all the difference along their educational journeys. For additional tips on eLearning delivery, be sure to check out our comprehensive resource: The Ultimate Guide to Delivering a Compelling Continuing Education Experience to Today's eLearners. And to learn more about our LMS focused on continuing education and corporate training, check out our Beacon360 page! Or simply contact us today for a complimentary demo and guided tour.